TWO businessmen and some residents of Don Salvador Benedicto have expressed strong opposition against the move of a few vacation homeowners to close the road-right-of-way (RROW) in Purok Saging, Barangay Igmaya-an, Don Salvador Benedicto (DSB). Peter Ike P. Trocio and business partner Vicent Mercado, owners of Stonepeak Cafe located in the area, along with some residents, revealed in a press conference Monday, April 1, that some vacation homeowners, through their aides, attempted to install a steel gate at the main entrance of the road to bar people from using the main road. The homeowners reportedly believe that the area is a private property and plan to charge a toll of between P50 and P100 for every head or car that passes through. Trocio said that the few homeowners claimed that the decision to close the road and put a toll gate was a consensus or decision by the homeowners association. “I am also a homeowner here, but I was never consulted of such decision to close the RROW. We are operating our business here with all the permits required by the local government unit (LGU) and we do not create any harm against other homeowners here. We are only utilizing our property for our business,” Trocio said. Trocio and Mercado said that they are contributing to the LGU in terms of tourism and employment. 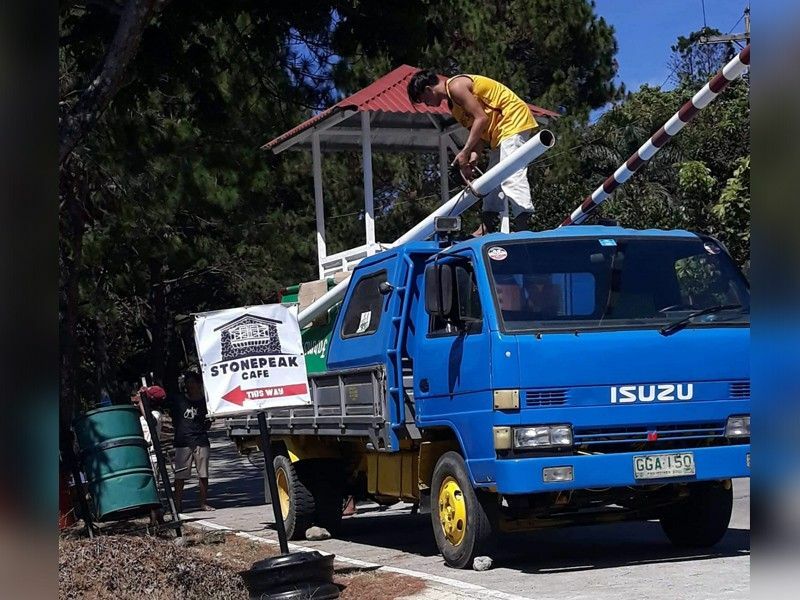 They said that they have already reported such threat of road closure to the local police of DSB, the barangay, and to DSB Mayor Lawrence Marxlen Dela Cruz. Dela Cruz said he received a letter from Elioson Tree Farms, Stella Yusay and others regarding Stonepeak dated February 12. Dela Cruz said the area is still classified as farm lots and not a subdivision. He said that the homeowners association is not yet formally organized. While land classification is important under zoning, it does not make the conduct of business patently illegal, Dela Cruz pointed out. “I am mandated by law to issue a business permit and to grant business application under Section 455 of the (Local Government Code), if the applicants meet all the necessary requirement and qualification,” Dela Cruz said. He said that Stonepeak Cafe has complied with all the requirements needed for the issuance of business permit and has operated within the legal bounds. As to the use of the private road, “It is beyond my mandated duties to limit, restrict or regulate private property rights to use the same, unless general safety, paramount health reasons, or emergency situations whereby the general welfare of the people is (affected). In such a case, the immediate intervention of the local government is a must,” Dela Cruz said. Some residents working at Stonepeak said they are worried they may lose their jobs if the road closure will be imposed because it may also result in the closure of the business of Trocio and Mercado. Tourists love the place because of the view and sumptuous food offered at Stonepeak, they added. The cafe has been operating for close to two months.